WILMER STULTZ and LOU GORDON Autograph Signatures. Wilmer Lower Stultz and Lou Gordon. American pioneer aviators. The pilot and mechanic who accompanied Amelia Earhart when she became the first woman to make a crossing of the Atlantic by air as a passenger in 1928. 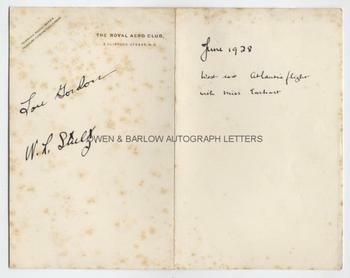 Autograph signatures of both on the headed notepaper of the Royal Aero Club, 3 Clifford St. W1. 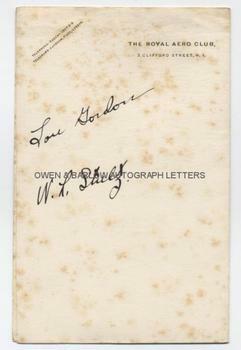 With a contemporary annotation on the verso, which resembles and could be in the handwriting of Amelia Earhart herself "June 1928. West east Atlantic flight with Miss Earhart". Approx 7 x 4.5 inches plus integral blank leaf. Some foxing. Very good. Before making her solo crossing of the Atlantic, Amelia Earhart became the first woman to make the crossing as a passenger in 1928. The pilot of the Fokker aeroplane that carried her was Wilmer Stultz and the engineer and mechanic was Lou Gordon. Stultz is also noteworthy as the first pilot to make a non-stop flight from New York to Havana, Cuba. Stultz died in an air crash in July 1929. 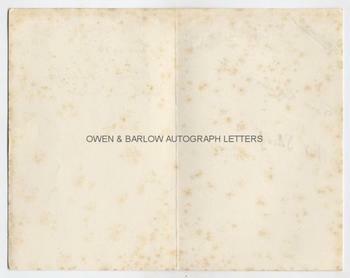 An uncommon pair of autographs.